Volunteer Peru: I did not expect to form part of the family. We had a great time altogether. I came to know their good friends and close relatives. We had a lot of fun listening to music. They made me discovered Peruvian culture, dance, gastronomy and ritual. 1.-How was the local ABV Coordinator/staff and the support provided in-country? My ABV Coordinator was Ms. Maria Elena. I remember the first time she came to fetch me at the airport. Her smile was enough to make me feel at ease. – when I was not feeling well or having homesickness. Cusco is a wonderful city, but it is also intensely poignant too. While walking on the streets, you can see people, mostly women trying desperately to sell their products. Most of the time, few steps ahead, their children entertained themselves with rocks, soil or broken toys. Late at night, in the cold, they are still here selling their goods. Sometimes, they have their baby on the back. None of them cried, like he/she knew his/her mother is working hard to get a couple of soles. This poverty is not only found on the street. I can feel it even in the kindergarten, the orphanage and the hospital. Some children wore snagged holes clothes bunglingly repaired. When you see the parents, so simple and kind, wondering if their child has well worked, listened and drunk the words of the teacher. For them, going to school is so important. Knowing to read and to write is supposed to be a fundamental right, but not everywhere…the right to go to school is still a privilege. The parents wanted a different life for their offspring. The same thing can be noted in the orphanage. The girls did not have lots of thing. What was most surprising is that little things can make them so happy. Getting toothpastes, toothbrushes and lip balms made them so happy. I do not think that we can find this in modern countries: the thankfulness of basic things of life. Things usually every child is supposed to have. 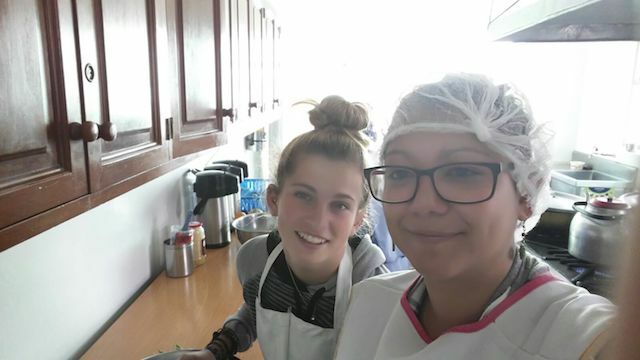 The girls worked hard in the kitchen, in the ceramic workshop, in the yard and also in my class. Most of all, love is all that they like. Maslow’s theory of hierarchy of need is well observed here. The basic necessity for human is food, love and feeling secured; then come the rest. The girls have the opportunity to eat equilibrated meals and have good collations. The girls in the orphanage love being listened and hugged. They like listening to music and were so happy to learn English. Not much of them have notebooks, pens, colouring pens or even pencils. They were so glad to receive these. I got the privilege to have a teacher in Montreal who helped me in buying clothes for the girls. They were so happy receiving sweaters, school supplies and body care products. I was surprised that there were only women working and helping in the hospital. However, there are boys volunteering there. The staff in the hospital has so much patience. They gave encouragements and have much empathy. The patients are well treated and fed. On the other hand, they lack good clothes and equipment for re-education in physiotherapy. However, the physiotherapist did the best with the means at her disposal. Host Family: I did not expect to form part of the family. We had a great time altogether. I came to know their good friends and close relatives. We had a lot of fun listening to music. They made me discovered Peruvian culture, dance, gastronomy and ritual. My host’s mother and I do not have a great difference of age. Moreover, we have a lot in common. She was more like a big sister to me. I have four brothers and no sister. Now I do! There was not a time that I felt like a stranger. They looked after me, cared about me and most of all, I felt that I was appreciated. I was invited to the festivities held in the school of my host’s son. 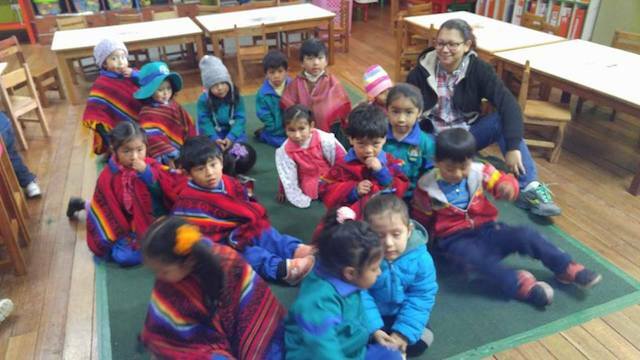 I came to know the educational practice in Peru. It was interesting to learn the contrasts between Montreal and Peru. I’m studying in education. These were very enriching discussions. We exchanged on social, cultural, historical and economic themes. I got the privilege to attend some performances done by the students. There was a variety of costumes, dances and masks. I was explained the dichotomic tradition- Inka and Christian- which adds to the diversity of Peru. Friends, families, teachers and even unknown persons joined the conversation, contributing to a pleasant atmosphere full of warmth. Country: What astounded me here is the Peruvian culture. Both the way of living and the environment are shaped by the Spanish colonial Christian tradition mixed with Inka’s ancestral power. When we come to try the cooking style, we have a lot to choose from. Indeed, the food is a mixture of various ingredients and savours, combining different other cultures, like Chifa (Chinese) for example. formations and beliefs; history of the Inka and the Spanish colonisation). These take months to be done and the work is perfect. It is incredible when we think that is a handmade weaving. It is also very colourful. 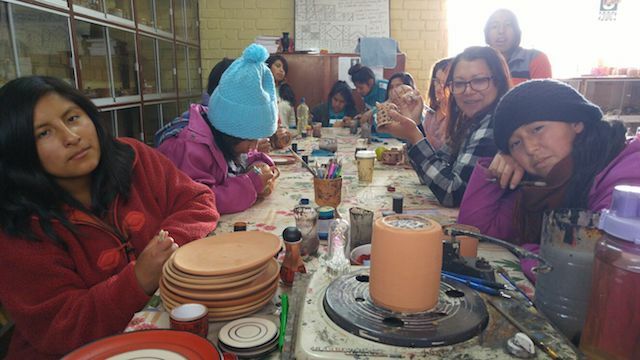 I got the opportunity to do some ceramics in the orphanage. Peruvians are very known for this. The designs, like the textile, are traditional. The geometrical designs and patterns are so minutely and nicely done.I was mainly in Cusco. It is so interesting to see, learn and understand the rich history depicted by the architecture. I have mostly chosen Cusco, because I like history. Indeed, for the Inka, Cusco means the Centre of the World. It is so worthful to explore the Inka’s ruins and observe the people of the villages. The dichotomy between the main city and the surrounding campaign is astounding. Otherwise, in both places, we can appreciate many churches and museums. The paintings are so indicative of the Christian belief, of the oppression of the Spanish and give hints on the footprint of the Inka. The markets are full of handicrafts things and at very low prices. Life is lively here, but the worst part is that early in the morning and all day long, you can hear cars honking. The drivers are a bit crazy and the traffic not all the time very easy. Anyway, we get used to it! We need to be careful and audacious! Nevertheless, while walking early, we can appreciate street vendors with their delicious hot drinks and bread. I did a lot of things by walk. I was well situated and all is quite near (max 40 minutes by walk). In The historical centre (Plaza de Armas) and streets next to it, we can find all that we need. In kindergarten: In my class, around 25 children aged 3 and 4 needed care and attention. At the beginning, the language was a barrier, but with a lot of gestures, within hours, it became easier. I needed to be creative to make them learn English through expressions and drawing. They had an English book which I used to do my lessons. I have also brought a lot of papers from Montreal. Orphanage: I was assigned to teach English. Not easy to teach when you know just a little bit of the other language; here Spanish! So, I had to work hard at home to look for the proper translation. I wanted them to know the most of it. Moreover, I wanted my lessons to be useful for a long period of time. So, I did a program, exercises, gave homework and did an exam to know where they were. I gave them the basic things they needed to be able to follow my class. Furthermore, I have printed concepts taken from internet, books and other I made myself, for them to be able to revise and also to continue with other volunteers. I was here for the girls, but also, I was here to teach English. It was not always easy to deal with the delays. Moreover, it happened that I came to know, at the last moment, that the English lesson was canceled. Before my travel, I have been advised by ABV about these setbacks, but it was not always easy for me to cope with. Anyway, I was with the girls and it was what counted most. Cancer Hospital: Most patients are between 24 and 60 years old. Some of them both physically and mentally handicapped and under medical treatment. They come from poor families and live relatively far away. They have the advantage to have physiotherapists, dentists, nurses and volunteers to look after them. In France, I have worked in hospitals specialising in geriatrics and neurodegenerative diseases. 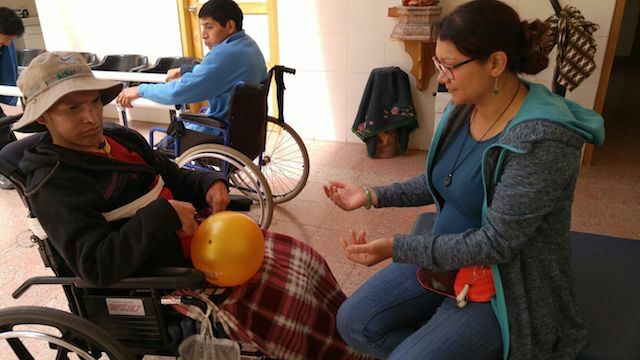 However, it was not easy to deal with young adults having rigidity, dystonic hypertonia or loss of motor control. Having worked in the neurological field, I could understand the sequels of disorders such as cerebral palsy, stroke and spinal cord injury. Thinking that these young patients would not be able to work, travel, in all live normally was heartbreaking. What was the most astonishing is that, they kept on smiling and they seemed to be happy. None of them complained, not even once. I came to help there, but they helped me. I found their situation really sad and sorrowful. Sometimes, tears rolled down my cheeks and they were the ones soothing me. Their words were full of hope. They were inspiriting me to accept life as it comes. Yet, I did have some difficulties in accepting their condition. My name means hope, there I came to know the real meaning of it. Through people I thought desperate, I have learned so much. Host Family: I had a good relationship with my family. However, at the beginning, I was not feeling at ease to say that, on and off, I wanted to eat other things outside. I remained two months there and eventually things have settled by themselves. With time, my relationship was better and better. Well, it is normal; we came to know each other more. Once again, at the beginning, I was like taken for a youngster. I am 34 years and I am used in doing my things alone in Montreal. They were so caring that sometimes I felt overprotected, mostly with the grandmother. In hindsight, I prefer indeed caring people. With time, they came to know me more and understand that I am a thoughtful person. Time passed by and both parties felt more at ease. Country: Cusco is a city having 3400 meters above sea level. Not always easy to cope with it. It is important to drink a lot of water and having a nap in the afternoon really helps. Being claustrophobic is not easy. I had to deal with somatic symptoms (breathlessness, palpitations, headache, hyperventilation, and insomnia). Breathing into a paper bag for a couple of minutes is useful. It helps “reabsorbing” the expelled carbon dioxide (CO2) and rebalance the blood pH. Trying to breathe very slowly, taking shallower breaths and keeping my calm were challenging to me. I have nevertheless succeeded to overcome my fears. It was difficult to run, to play volleyball and to do hiking, but I manage to do it either way. I came here in June, July and August. It is winter! But during the day, it is hot (22-24C degrees). At night and in the morning, it is round 2-10C degrees. So, we really need clothing both for cold and hot! If you go sandboarding or to jungle (Selva), it is really hot there! I asked for a second luggage to my travel agency. I showed the proof of my project. At the last moment, I was allowed one more. There are things that are better to buy in Peru and other better to bring from your country. Depending on your project, you can ask help from your coordinator. This is very important. Thanks, that I have taken one from my university! The clinic here is expensive. Rain proof jacket (I went to Machu Picchu and it was so much raining, all my things got wet!! ); Buy a plastic rain poncho before hiking, in case it rains. Those having glasses, sunglasses with prescription is not luxury. Departure Note that the date you put to end your program on the website ABV is the date you leave your host’s family. So carefully planned your dates for visiting and those for your work. Money: The Peruvian currency is sol (S/.) With what I have experienced here, Euros and US Dollars can be easily changed. It is important to note that VISA-cards are the most commonly used credit cards. I did have trouble in some cities, where shops do not accept my American Express or Mastercard. Make sure that you are allowed, by your credit cards, to remove money from the automaton. I did have a lot of problems with that. Moreover, every time you remove money there is a fee of 18S/., in addition to what your bank takes you. Most of the tours are paid in US dollars and in some, no cards are not accepted. The artisanal shops mostly take only soles in cash. So better bring NEW US dollars, Soles and VISA card with you! Celebrex (Celecoxib), Aspirin, Smecta (Diosmectite), Primperan (Metoclopramide), Advil (Ibuprofen), Charcoal, Imodium (Loperamide), Spasfon Lyoc (Phlologlucinol), triple antibiotic ointment (Polysporin) and antiseptic ointment. Better to do all. Some can be done here, but need a delay to be effective. Like for example, if you want to go to the jungle, it is better to do it two weeks before. Even if in your country, you said “Oh, I won’t do this!” It will surely happen that here, while meeting other people, you came interested in doing more things!! Yes, indeed it is an honour when someone propose you to drink in the same glass. But, be prepared also to eat the same food and in the same plate, eating with fingers and laughing while eating! I am writing this part, when all the others have been written! So much emotions in me while thinking back of my days in Cusco. I would like to think that I did make a difference. I hope to have contributed and consolidated through my work with ABV USA. Culture is an antidote to violence, because it invites us to the prayer of others and fosters tolerance, by encouraging us to meet other imaginaries and other cultures. Through my experiences here, I gained in maturity. I came to be more open-minded and flexible. I learned to understand through hugs. Volunteering here was an opportunity to share with others. I have made a lot of friends and filled my heart with a lot of unconditional love. As I once said, we are not only a citizen of our country, but also a citizen of the world. Thus, we can be useful in any society. We are here not only for ourselves, but for others. 7- How would you describe your accommodation, meals, security, friendliness, quality, others…? My accommodation suits me. I got my privacy and all what I needed. Anyway, we came to volunteer and we should not expect a lot. However, my host family made it easy and granted me more than expected. When we came to know the Peruvian style, we appreciate the food. I am a person who likes to taste new things. Some people found it hard to eat the Peru’s guinea pig, known as Cuy, but it’s good. There are many grains here, mostly the Quinoa, which is one of the traditional Peruvian diet. There is a variety of potatoes. They have other good starchy foods like: rice, Manioc or Cassava (Yuca) and sweet potato (Batata). In general, the food is very nice. I came to taste a lot of things: Alpaca (my favourite! ), duck (Pato) and rooster (so good! ), fish eggs and sea weeds (don’t like much! ), fishes (Trutas and Paco, miam!) and skewers of beef heart (Anticuchos miam!). The soups (Sopa) are very good with lots of legumin. Cerviche, Chicharron, Lomo Saltado, Churro, Mazamorra, Postres de tres leches, chicha morada, Pisco Sour, Cusquena beer, Mate de coca should not be missed. 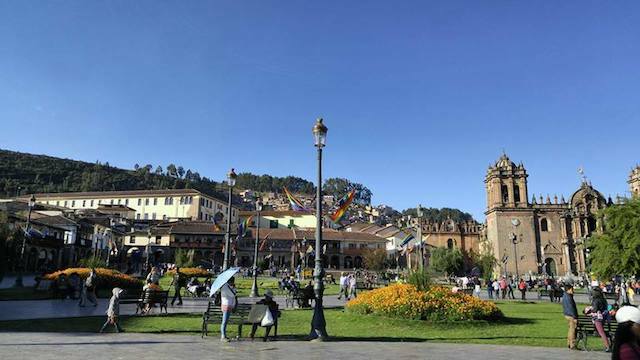 In general, it is quite safe in Cusco. The buses are not expensive. I advise to take any Taxi during the day and Branded Taxi (Tourismo…) at night. In addition, it is good and more practical to have a small bum bag. However, I have always felt safe here. Moreover, people are very nice and friendly here. 8- What was your favourite memory of this trip? What is astonishing is the way the children put all their heart when they sing the national and the Cusquenian’s anthems. Every Monday, they have their rituals to start the week in a joyful way. Teachers, pupils and all the staff sing and dance altogether. These were enraptured, heartening and jubilant moments. Another surprising thing is the proximity of the parents and the pupils with the staff and even with me. Before the little cuties arrived and went home, I have a hug and a kiss. So, in all 25 pupils, so 50 hugs and kisses each day! And even from the parents. These make a lot of hugs and kisses. It really made my day! Talking about hugs before, I got great hugs and souvenirs from the girls in the orphanage. I had priceless moments over there. 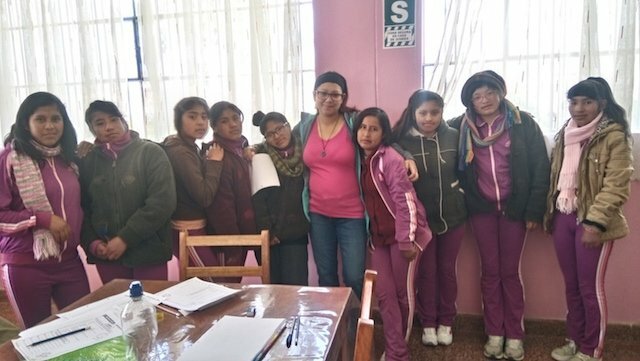 I did a lot of things there: cooking, gardening, working in the crop fields (Chacras), ceramics workshops (mainly painting), playing with the girls (volleyball, running, talking, listening to music), trying to comfort them (in Spanish not that easy) and teaching English etc. The girls did not think of being capable of working hard. Indeed, learning vocabulary, grammar, tenses and verbs was not easy in only few times. The girls were motivated and so was I. We helped each other. Both parties have its forces and challenges. They helped me with my Spanish and with ceramics. They showed me how to work in the field and I showed them other ways of cutting in the kitchen, in order to be more rapid and efficient. I finish my last day with an English examination; created with respect to what I have taught. I gave gifts to everybody and mostly to the first three highest scores. I did not expect to receive lots of handmade cards and letters explaining how much they loved it to have English classes. They came to trust themselves more and started to believe in their working capacity. They wanted more English classes. I did a folder with all my lessons and things that remain to do. It would be so great that other volunteers contribute to make the girls bilingual. These are just a glimpse of the wonderful memories I have in volunteering in Cusco. Si no puedes volar, entonces corre. Si no puedes correr, entonces camina. Pero hagas lo que hagas, tienes que seguir avanzando. I had the privilege to be invited to the celebration of Virgen del Carmen. I have noticed several types of dances, coloured costumes and masks. These choreographies represent Cusco’s history; evoking Inka time, slaves who worked at the Colonial invasion time and other dances relating invasion during the 19th century. The festivities I have attended were held in a church. It seems to be a social organisation and also having good time with families, friends, teachers… where we were together sharing traditional food and music. I spent a weekend with my host’s family in Quillabamba; a town which is six hours from Cusco. It was fantastic. We went to the river, to the swimming pool and some viewpoints. We had a great time sharing food and our cultures. It is really very hot there, but also very beautiful. It is astonishing how 230km apart can make a completely different climate. Maria Elena organised surprised birthdays for her volunteers. With the help of Maria Elena and other volunteers, we decorated, bought cake and prepared food for special occasions. She invited a dance teacher for us to learn Salsa and Bachata dances. Once, we all contributed to buy ingredients and cooked our cultural food. It was a way of sharing a part of our culture. She also does something special when the volunteers departure. I had brought clothes for kids and the second time we did a special breakfast for the patients in the cancer hospital, there were Kekes (soft orange cakes) left over. So, Maria Elena and I went down the street distributing pieces of cakes and clothes for poor kids. We looked out for people in need and offered these. Happiness and gratefulness could be read on their face. These were one of the best time with Maria Elena. Arriving at the Hydroelectrica, I walked- with two other friends whom I met in the volunteer program- along the railway track leading to Aguas Calientes. After a good night’s rest (2 hours! played till late at night with my friends!). We left for 4:30 am on foot to climb up the Machu Picchu. We walked about a little less than 2000 steps! After minutes of difficult walking we think we are close to the arrival … but not we still have about an hour to climb! (A hard blow for the mind!!) We have to go all the way up the mountain. We walked while enjoying the sunrise and the beautiful scenery that surrounds us. But, once on the site, we were in the clouds so we could not see much. Anyway, before going down, the “neblina” (fog) started to disperse and we had quite a nice view of the Machu Picchu. I have back problems and my hip has the tendency to dislocate. Walking and climbing the Machu Picchu was for me a challenge. I did not think I could do this and in the end, it was a real pride: an overcoming of the self. Through these, I came to know who I really was: a determined, an optimistic and a self-confident person. It is important to consider that the mind has an important power on our body. Puno is a south-eastern town of Peru. On my way to Puno, I have visited a lot of ruins and museums. My trip to Lake Titicaca was interesting. I visited artificial islands built in reeds. We were explained how these islands were constructed and the native people explained their way of living. At the top of the main Island (I think Taquile! ), the sight of the lake was breath-taking. ABV USA is so fantastic. I don’t know how they can be so present. Indeed, all the time I have a question or a doubt, I was answered very quickly. I mostly used emails with Sarah and Lynn, and chat with Lori. What is so nice is that you have the chat mode, where you can talk, modify and ask questions. For me, Lori was a precious help anytime I had a question. In less than 24 hours (sometimes minutes!!) I got my answers (all of them!). They are efficient, helpful, reliable and so kind. We can’t ask for more dynamic and business-like professionals. The reservation system online was so easy. Anyway, the steps are so clearly specified and precise. Everything was just fine. 9.2- Where did you find Abroaderview website (keywords, search engine, word mouth to mouth, recommended by …, other). I came to know ABV through my director, Mr. Dery. My travel to Cusco is an internship offered by my university (Université du Québec à Montreal – UQAM). Mr. Dery suggested me ABV with respect to my criteria. Then, going through the search engine on ABV’s website was easy to find what I wanted. Why not seize the day? So, seize the opportunity to be a ABV volunteer.